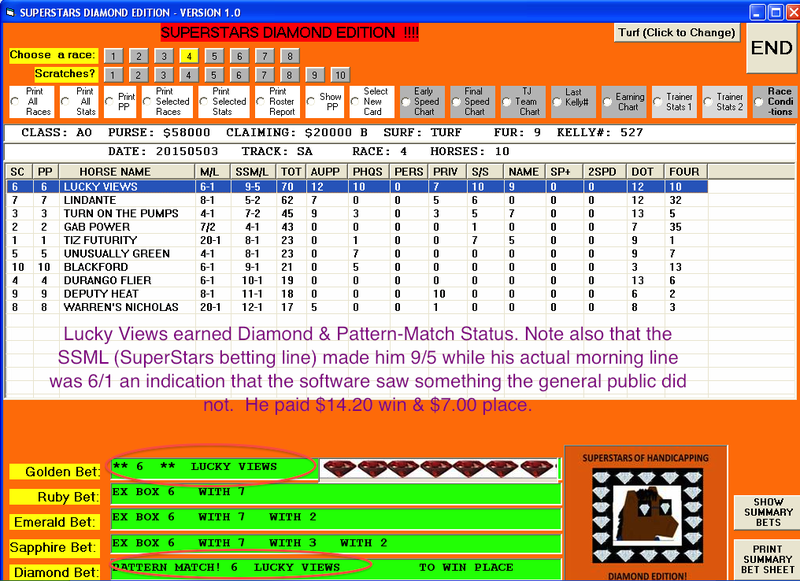 The SUPERSTARS of HANDICAPPING – DIAMOND EDITION!! Experience Hi-Tech Handicapping to its Max!! 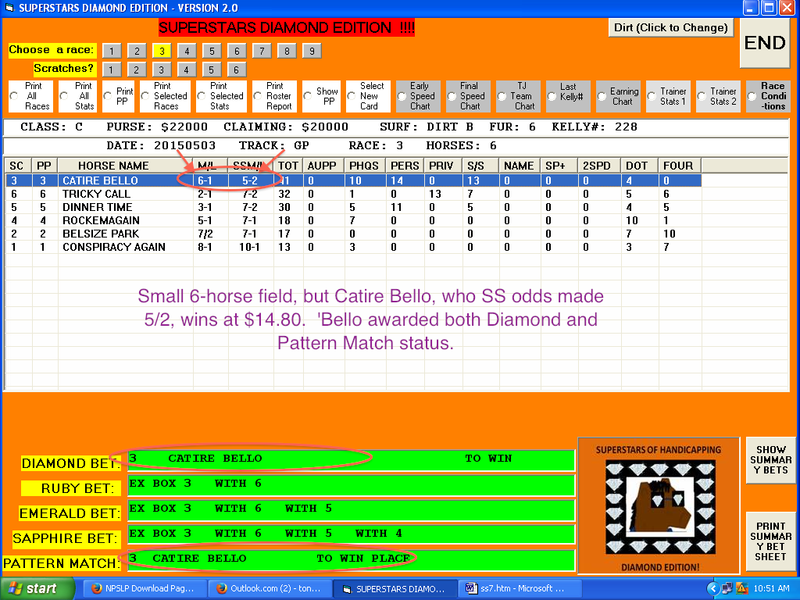 The NEW Superstars of Handicapping – Diamond Edition! is much more than your ‘standard’ update. News Flash!! 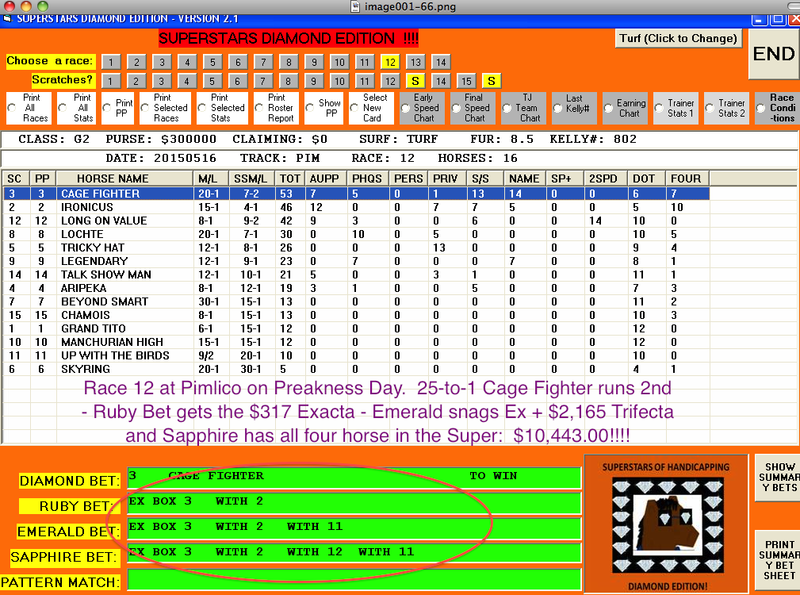 – SuperStars really on a roll – several big wins/exactas/trifectas including Race 12 on Preakness Day at Pimlico where Software caught the $317 Exacta, $2,165 Trifecta and $10,443 Superfecta!!! 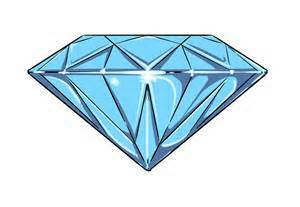 Superstars Diamond Edition employs 10 different High-% Methodologies to arrive at a ‘Consensus’. And, since all of the Columns are Sortable, you can track each Methodology individually if you wish! >>>>up-to-the-minute totally accurate trainer stats – stats cover every situation imaginable – layoffs, first-timer stats, distance or & surface switches, etc., etc., which you can check out on your own if you wish, and all of these stats are also incorporated into the selection process. Superstars Diamond Edition creates a Betting Line that provides the user with endless opportunities to cash in on overlays. Based on Mark Cramer’s ‘The Odds Are On Your Side’ book which detailed exactly how to manually construct an accuarate betting line, you can use this tool over and over again to locate horses the the general public miss. Also … speed/pace/jock/class/earnings charts, view/print daily program, view/print past performances, view print Summary Bet sheet, etc., etc., etc. ***but the new software …. Like the new ‘DIAMOND’ Plays, for example! 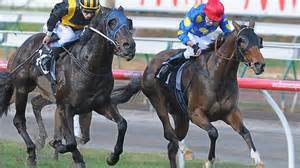 >>>Diamond plays are generated when the already, super-accurate top Consensus horse also possesses a couple of traits that make him a true standout to hit the board. 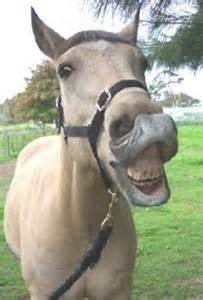 >>>>Diamond Plays will run 1st (38%), 2nd (62%), 3rd (85%) making them ‘must-use’ horses for all those slots as well as in the Exacta/Trifecta/Superfecta! A nice Price from a pretty obvious contender according to the software. What, exactly, is Pattern Matching? This is an enormous help to the horseplayer who would otherwise have no idea that the horse is in a position to run big because the horse has run well previously when today’s probable race shape, pace, distance/surface/pace, etc., was in play. And, as you would expect, Pattern Match horses often return healthy mutuels because, again, the average, or even above average player is not likely to recognize these matches from the past performances. Lucky Views rated ‘Standout’ status according to SuperStars, but went off at 6/1 when the SS betting line made him 9/5. 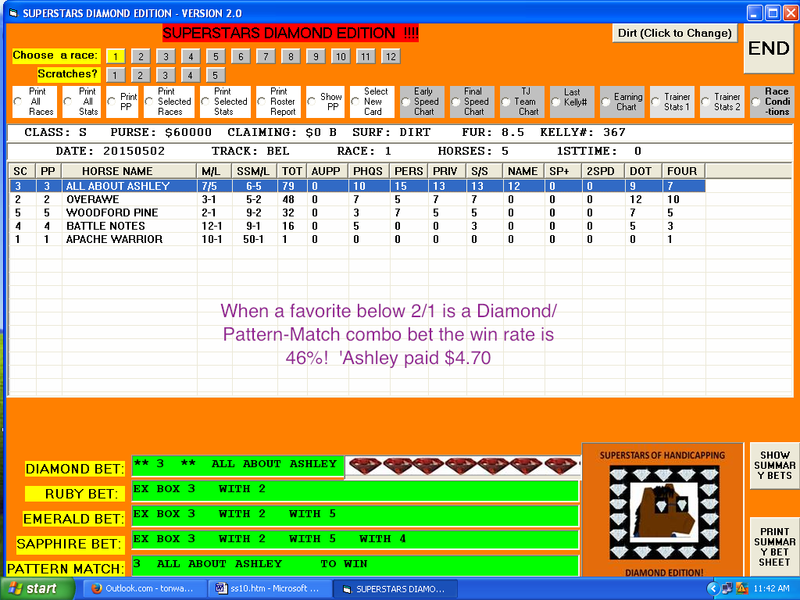 Another Diamond/Pattern Match Double Qualifier – $14.80! Below is another Wagering Option SSD will provide for you. Also here is another situation where the program’s odds-line pointed the $21 winner as a strong contender by saying that the horse’s odds should have been in the 5/2 range — she went off at 9/1. Below an Exotics ‘Sweep’ – nice prices. Tap And Trade was the favorite, but the prices were very good considering the small field. Below – while Joann’s Wildcat ran 3rd, the 4-horse (Sapphire) swept the Exotics – $127.80 Exacta; $174.80 Trifecta & $234.50 Superfecta! 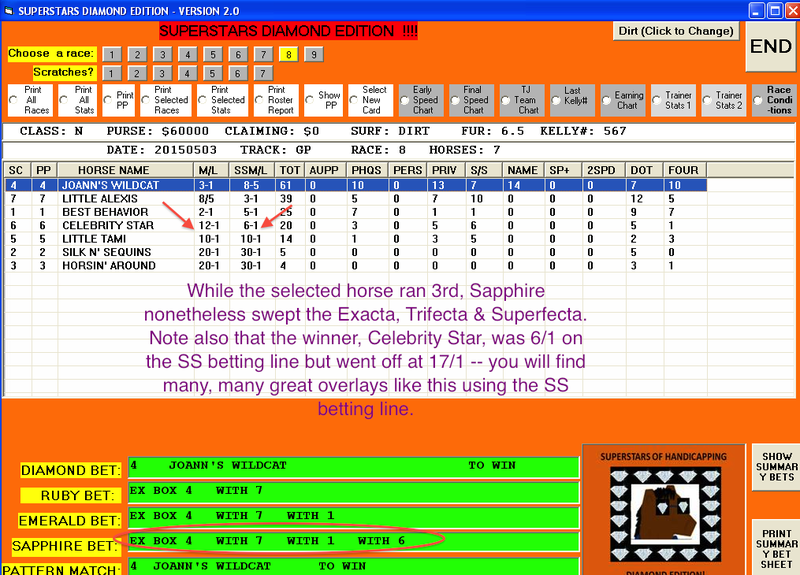 Note also the overlayed price on winner Celebrity Star in relation to the SS betting line. A Stat you can Take to the Bank!! When a heavy favorite (below 2/1) is both a Diamond and a Pattern-Match the win rate is 46%+! 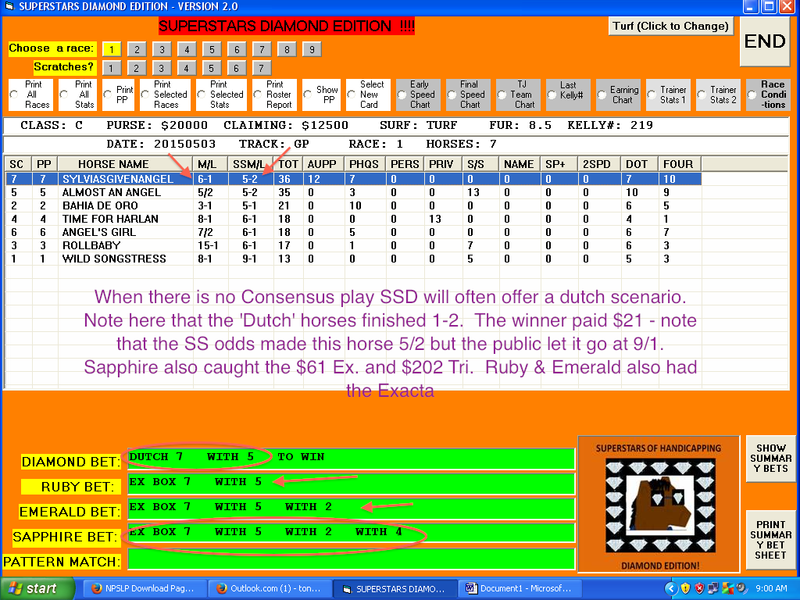 Here’s a situation where the main selection did not hit the board, but the bettor was pulled out by both the Emerald and Sapphire Bets. 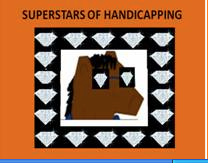 The SuperStars of Handicapping, Diamond Edition! 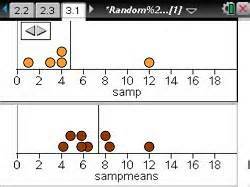 We are also going to send you Len’s Superfecta Randomizer Software for FREE!! 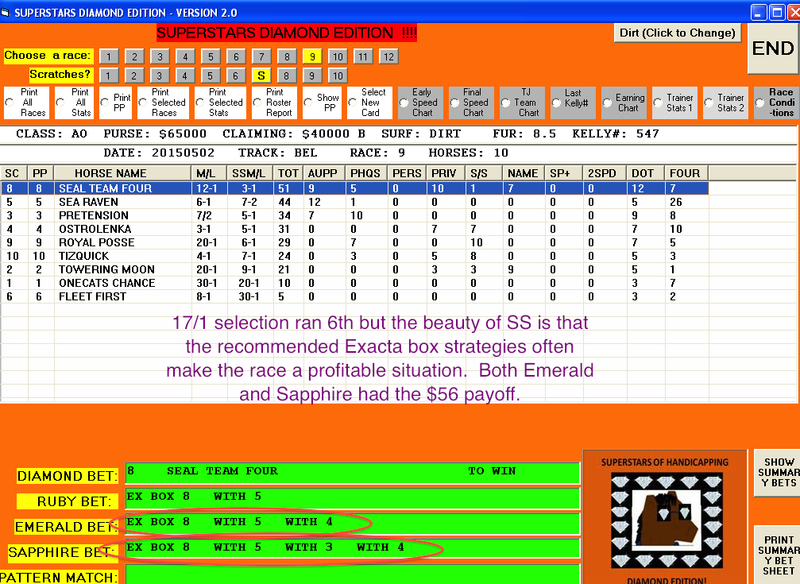 Superfecta Randomizer is designed to locate high percentage Superfecta wagering situations in larger fields (9 horses+). >>>>>Using .10 Superfectas over the entire recent Santa Anita, Aqueduct and Gulfstream Meets, Superfecta Randomizer produced a +38% ROI, which included many dime Supes that paid over $500! 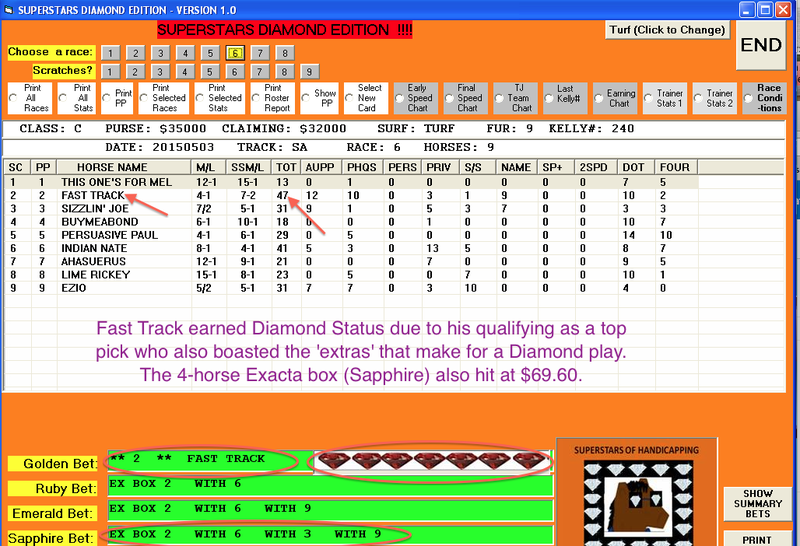 And it’s yours at no extra charge when you order The SuperStars of Handicapping, Diamond Edition!